The dust-laden wind was drying his bared eyes, and his vision was dwindling. Tears, the tears of his body rather than the tears of his heart, ran unchecked down his cheeks. The severed muscles that had once worked his eyelids twitched in helpless reflex; they could not moisten his eyeballs and renew his vision. Just as well; there was little out there he wished to see. 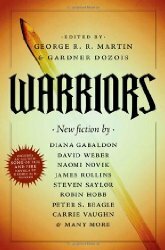 Ages since I read this, I have to admit, but looking back three stories stood out - two which both look at the Rome/Carthage conflicts from different perspectives, Robin Hobb's "Triumph" and Steven Saylor's "Eagle and the Rabbit"; and Carrie Vaughan's "Girls from Avenger" about women pilots in the second world war. There were a load of other stories tying into series, some of which I know and some of which I don't, but those made less of an impact on me. This was my top unread book acquired in 2011. Next in that list is 1434: The Year a Chinese Fleet Sailed to Italy and Ignited the Renaissance, by Gavin Menzies.